I’m having an interesting problem. I am shooting a toy for a photography class and I can’t get the color right (shown here with window light). It has to be in natural light. I’ve tried all the white balance settings including the entire Kelvin scale. I’ve also tried every workable ISO, Shutter and aperture setting and I still can't get it right. I’ve tried 3 different lenses and two other cameras and they all yield far less that a perfect match. The attached iPhone shot it indicative of the problem. There is a lot more green in the hue of the actual toy bowling pin, but every shot I take is too far off to even adjust in post. Any ideas about what I might be missing? Are there other colors around the toy? Normal things, such as auto color and auto exposure in camera raw in Photoshop do not help. You are shooting, it seems, a reflective surface, over exposed, and in blue light (from the sky). Work on those problems, would be my suggestion. My wild guess is direct sunlight if that is the case photo outside during the evening hours hopes this helps saying hello from Pittsburgh. I’ve tried it with a black background as well. No difference, the color is still off. Good point. The blue Sky reflection could be a problem, but the iPhone shot I used just to illustrate the problem was shot indoors with window light only. Why not use an X-rite colour checker passport target next to the bowling pin. Take a shot, then remove the CCP and then shoot again. In Lightroom you can then calibrate the colours from the 'target' shot. How are you viewing the shots? If you are looking at all of the shots on the same monitor ......, it could be that the monitor is out of calibration. Lots of good ideas. Try this: make sure the entire background is black (or white); get a piece of black (or white) poster board if necessary. Diffuse the sunlight with a thin white sheet over the window. 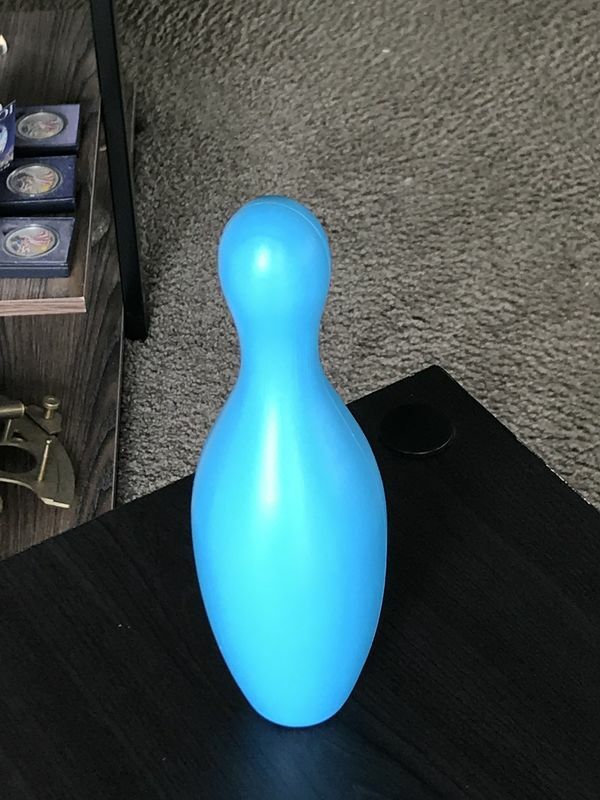 Remove anything of color around the bowling pin. By the by, what color are the walls in the room? Do a custom or preset or manual white balance (different camera companies call it different things). You'll need a suitable white balance target. Most of them are also excellent for nailing exposure in JPEGs. They all work as aids to "click balance" with an eyedropper tool when post-processing. Professionals use the X-Rite ColorChecker Passport and Adobe Lightroom software to achieve true-to-life color (or as close as you can get in photography). If you have Photoshop, make a selection of the blue pin and then change the color using the available adjustments. Should work.